These big, fluffy dogs are independent and intelligent. They were originally bred to work as sled dogs in the Arctic. They do well in homes with no other dogs, because they have a tendency to fight for alpha status. They can be stubborn, so they are best suited for experienced dog owners who know how to train them. To protect them from the cold, they have a thick coat that may require some extra care. There are a few health issues that affect this breed. Cataracts and a condition called “day blindness” can show up at a relatively early age. Like other big dogs, hip dysplasia is common in Alaskan Malamutes. This occurs when the femur doesn’t fit into the hip joint properly and can cause pain and lameness. They are also at risk for hypothyroidism. This condition may need to be treated with medication, but a healthy lifestyle may keep symptoms at bay. A good diet may help prevent, or lessen symptoms of many different health risks. Problems with hip dysplasia commonly arise when the dog injures himself by jumping or falling, or when the bones grow too quickly. Large breeds like Alaskan Malamutes need special nutrition as young pups, so their bones don’t outgrow their joints. Lots of puppy formulas are packed with calories to fuel young bodies and help them grow, but this breed doesn’t necessarily need it. If your puppy is growing very rapidly, take a look at the nutrients in your dog food. There might be too many calories or too much calcium for your big dog. Dog foods for large or giant breeds are specially formulated to curb excessive growth because they limit certain nutrients. It’s also a good idea to keep your dog away from dangerous activities like jumping down from high furniture because it puts them at a greater risk for hip injuries. Extra weight may also aggravate your Alaskan Malamute’s joints. Excessive weight gain is generally caused by not feeding your dog the proper amount of food, lack of exercise, and feeding your dog table scraps. 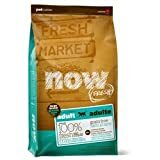 Your dog food bag should have a feeding chart so you can feed your dog the calories they need according to their weight. If your dog does not finish her meal within twenty minutes or so, you should take their leftovers to prevent them from grazing later. Also, adjust their food intake depending on how much exercise they get. They are energetic dogs, but you might notice that they may not expend as much energy during the summer because their body and fur makes them too hot for extensive exercise. If this is the case with your dog, you may want to cut down on their food. Also, avoid feeding your dog table scraps. Not only will it cause them to gain weight, but “people food” is often made with extra oils and flavors that may not be good for your dog. Along with keeping an eye on your dog’s weight, it is also important to notice any symptoms of food allergies. If your dog has frequent stomach discomfort or diarrhea, they may be allergic to one or several ingredients in their dog food. Corn, wheat, and soy are thought to be common allergens in dogs and are found in many dog foods. There are also special dog foods for dogs with allergies that contain very few ingredients, so there’s a good chance that the allergen is cut out. There are certain nutrients that can make your dog healthy and happy. Glucosamine and chondroitin are ingredients found in chicken cartilage and in supplement form that are great for your dog’s joints. All joints go through some natural wear and tear, and these substances can help improve the condition of your dog’s cartilage and connective tissues. These ingredients are found in lots of dog foods for large breeds, but can also be purchased as an extra supplement. Owners report that their dogs are no longer in pain and can move much better after including glucosamine and chondroitin in their diet. Hypothyroidism is common in Alaskan Malamutes and while it can’t be completely avoided, there may be natural remedies for it. Of course, check with your vet if your dog has hypothyroidism, because medication may be necessary. It is believed that kelp, which is rich in iodine, can help with thyroid function in dogs. Look for kelp in your dog food because it may improve symptoms. Along with treatment, fish oils or Vitamin E may help relieve dry skin—a symptom of this disease. Probiotics are special types of bacteria that help with your dog’s digestion. These bacteria help break down foods that are difficult to digest. This can help reduce the amount of gas your dog produces and can make bowel movements more regular. There is also research that suggests that probiotics can strengthen your dog’s immune response, protecting them from illness and inflammatory immune responses in the body. Along with fiber, probiotics can make digestion easy and pain free. This dog food is joint healthy because it contains chicken meal, which is a good source of glucosamine and chondroitin. For protein, it uses whole chicken and chicken meal. For carbohydrates, it has brown rice, brewers rice, and oatmeal. This is a good mix of simple carbs and complex carbs for immediate and long lasting energy. These carbohydrates are easy for dogs to digest, so there shouldn’t be any stomach upset. It uses chicken fat, sunflower oil, and soybean oil to keep your dog’s skin healthy and help them absorb fat soluble vitamins. Besides these ingredients, this food has all of the necessary vitamins and minerals that dogs need. This formula is fairly simple and should agree with your dog’s system well. Unfortunately, this food doesn’t contain any fish oil or probiotics. This food is grain free and has a short list of ingredients for dogs with allergies. It uses lamb meal as the sole meat source. For carbohydrates, it uses rice, barley, and millet. This is a blend of simple and complex carbs and should keep your dog energized and satiated between meals. This food uses chicken fat for its major source of fat. It doesn’t have fish oil, but it contains flaxseed, which is a good source of Omega fatty acids. Omega fatty acids are good for the skin and coat. Something this food does well is include supplemental glucosamine and chondroitin for joint health. This formula also contains supplemental fiber for regular bowel movements. Now Fresh Grain Free formula uses varied sources of protein. It has whole turkey, eggs, salmon, and duck. Fish is a great meat for dogs because it contains both protein and healthy levels of fat. Fish oil is beneficial for dogs because the Omega fatty acid support overall health. For carbohydrates, it uses potatoes, peas, and tapioca. These aren’t spectacular carbs because they digest pretty quickly, but they’re easy on the stomach. 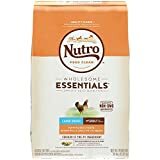 This dog food also contains fruits and vegetables, which are great for dogs because they have the right nutrients for your dog’s overall health. This food has carrots, pumpkin, bananas, blueberries, cranberries, pomegranate, spinach, and other fruits and veggies that are packed with antioxidants. It also includes glucosamine in supplement form and plenty of probiotics. Celebrity chef Rachael Ray now makes foods for your dog to enjoy. This formula does not contain corn, wheat, or soy, for dogs with sensitive stomachs. This particular recipe contains several different types of whole fish and fish meals. Fish is a good protein source and provides healthy fats. For carbohydrates, it uses sweet potatoes, potatoes, tapioca, and dried peas. Sweet potatoes are good for dogs because they provide energy and lots of vitamins. This food also contains added fiber, vitamins, Omega fatty acids, and poultry fat. This food is especially good for Alaskan Malamutes because they have a lot of thick fur that needs extra moisture. Fatty acids found in fish keep skin moisturized and make the coat sleek and shiny. At 24% protein, this dog food has just about the right amount of protein for your big dog. It uses whitefish meal and duck meal as its protein source. These are good meals for dogs because it contains healthy fats. It also uses good carbohydrates to keep your dog energized all day. It contains oatmeal, brown rice, barley, and sorghum. These also contain fiber and take more time to digest than simple carbs. For joint health, it contains chicken cartilage, a good source of glucosamine and chondroitin. Fruits and vegetables like carrots, celery, beets, lettuce, pumpkin, apple, kelp, cranberries, and blueberries provide vitamins, minerals, and antioxidants. Kelp may minimize symptoms of hypothyroidism. This supplement was created by a veterinarian to help combat eye problems. It contains a long list of extracts from fruits, vegetables, and herbs. This antioxidant formula works to fight off free radicals that cause aging. This supplement claims to work for different parts of the eye, like the lens, retina, and cornea. Alaskan Malamute are prone to cataracts, so this supplement may slow the progress of the cataracts. If your dog shows symptoms like dry, patchy fur and lethargy, they may have hypothyroidism. While this may need prescription medicine, there are supplements available that provide a natural remedy. This supplement contains human-grade herbs that may help the thyroid’s function. It has ingredients like bladderwrack, L-tyrosine, stinging nettle root, licorice, and magnesium. 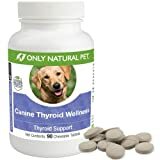 This may be a more affordable way to treat your dog’s underactive thyroid if prescription medicine isn’t absolutely necessary. 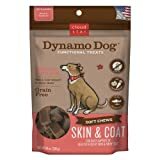 These treats are so tasty that your dog will never know that you’re giving him supplements that are good for skin and coat. This supplement uses real salmon meat, flaxseed, avocados, and fish oil to deliver healthy fats to your dog’s body. It also contains antioxidant-rich produce like carrots, apples, spinach, cherries, sweet potatoes, and cranberries. Vitamin E supplement is also added to protect the skin and keep it soft. These are important for dogs like Alaskan Malamutes because they have so much fur to take care of. How much do Alaskan Malamutes eat? You should feed your Alaskan Malamute four to five cups of food a day. Use your dog’s current weight with the dog food’s chart to figure out an exact amount. How often should I feed my Alaskan Malamute? One meal should be sufficient, but if your dog loses energy during the day, you can switch to two feedings a day. When is the best time to feed my Alaskan Malamute? Feed your dog in the morning, and again in the evening if necessary. Can I feed my Alaskan Malamute “People Food”? Avoid feeding your dog scraps between meals because it can lead to weight gain. How can I tell if my Alaskan Malamute is overweight? Your dog should have a clear waistline where it meets the hips. If your dog has more of a hot-dog shape, they may be overweight. I can’t tell if my Alaskan Malamute has a lot of hair or if it’s fat. How can I tell the difference? A tip for examining your dog’s body is to feel along the rib-cage after a bath. When wet, the fur will lay flat, giving you a better look at your dog’s frame. Alaskan Malamutes are big, furry dogs with a lot of personality. Feed your big dog a diet with plenty of protein, healthy fats, and whole grains. Fruits and vegetables provide energy and nutrients that will keep your dog youthful. Glucosamine and chondroitin are great for joint health and can be found in foods that contain chicken meal. With the right nutrients, your Alaskan Malamute will live a long and healthy life.